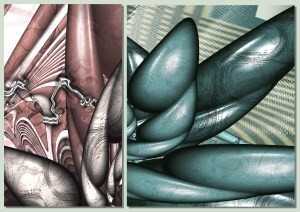 The artworks displayed in this website were all created by Elizabeth Mansco, using Corel Painter Essentials and fractal generating programs like: "Ultra Fractal" and "Apophysis". To enter the Gallery please click on the thumbnails and choose a year. All the artwork is organised into galleries, each displaying the fours seasons of the year, these categories have several artworks, both as static images and in slideshow format for easy "no-click" viewing. And full information if you are interested in placing an order. The images you see are small representations of the artworks themselves, prepared for viewing on-line. They can all be rendered to large sizes suitable for high-quality printing without loss of definition, clear and detailed. Titles inside the pictures are just a watermark and will not appear in any print. (Sorry if it disturbs,it's only an internet protection). Thanks for your visit! Hope you will enjoy your viewing!